On Mondays, retired U.S. Navy Rear Adm. Paul Becker drives from his home in Alexandria to the University of Virginia. He holds office hours to meet with students, grabs an early dinner on the Corner, then teaches a course, Middle Eastern Policy Challenges and Opportunities, at the Frank Batten School of Leadership and Public Policy. The next morning, Becker holds additional office hours before heading back to Alexandria. “It’s a beautiful 24-hour getaway,” he said. Becker said he has been approached by several universities about teaching closer to his home, but is only interested in doing so at UVA. 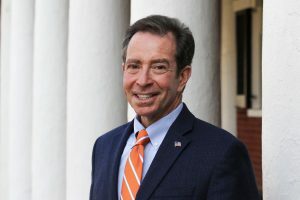 “I like UVA’s physical separation from the Beltway of Washington, D.C.,” said Becker, who has taught at UVA since 2017. “I think there’s a groupthink and an influence from being so close to the Capitol building that impacts the perspectives of both faculty and students. Becker also likes the fact that certain facets of UVA and the Batten School remind him of the U.S. Naval Academy and Harvard University, his alma maters. “I see a nice combination of the two,” said Becker, noting the Honor Code, an emphasis on building leaders and the spirit of public service he sees on Grounds and in Batten’s newly formed National Security Policy Center. Becker said he wasn’t pursuing a career in teaching after leaving the Navy, but a chance encounter with Batten Dean Allan Stam provided a unique opportunity. “My work-life experience is the strategic value proposition that I bring, as opposed to a Ph.D. degree,” he said. Over the past three semesters, Becker also taught courses on the U.S. Intelligence Community and Indo-Pacific Policy Challenges and Opportunities. Which threats are the greatest?